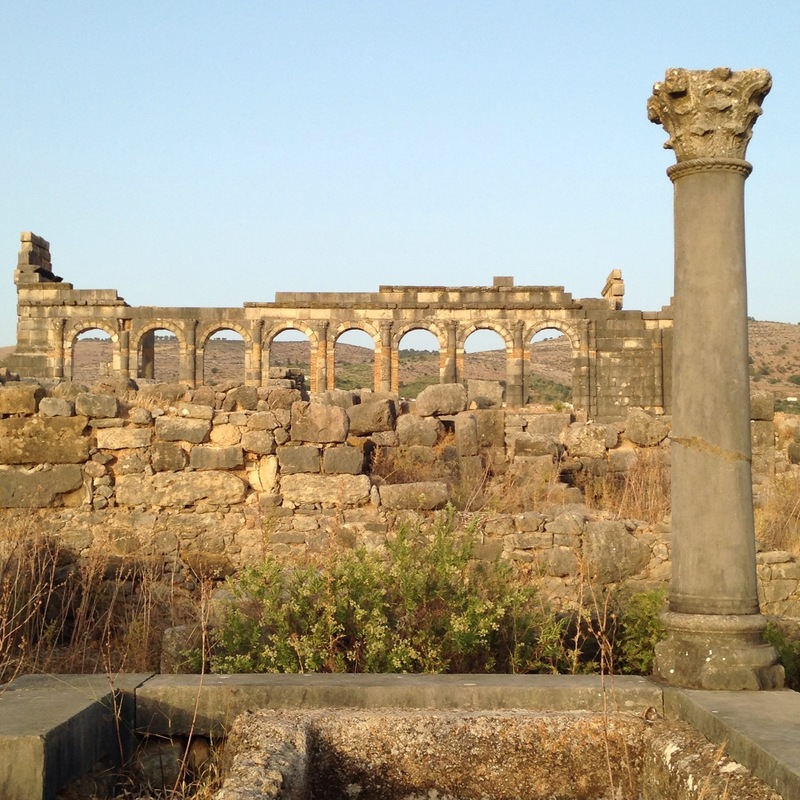 While in Fes Jon and I found a charming guest house on Air B&B in Moulay Idriss over looking Volubilis, the name of the ruins of one of the Roman capital cities in Moroccan in 200 A.D. and we booked it right away. It was a great decision! 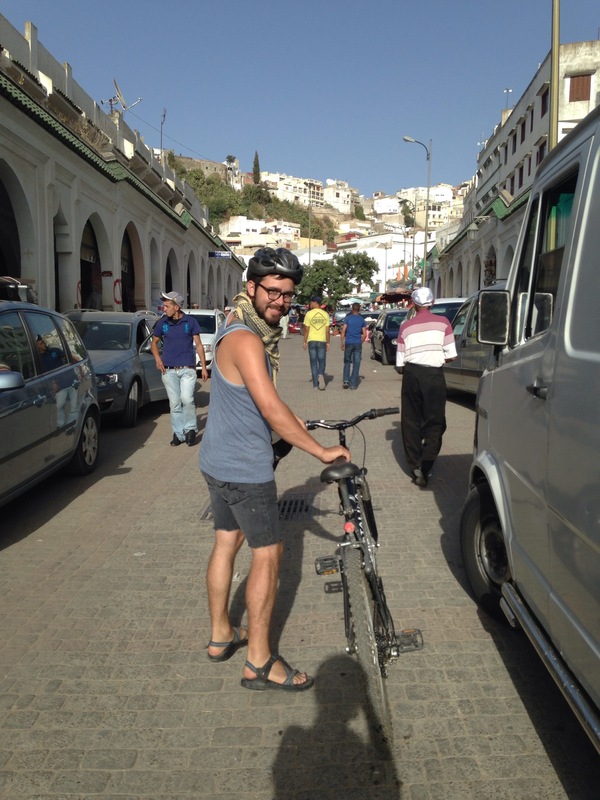 Moulay Idriss is the holiest city in Morocco for Muslims. It was named after the great grandson of Muhammad who is buried in the mosque in the heart of the hilltop city. 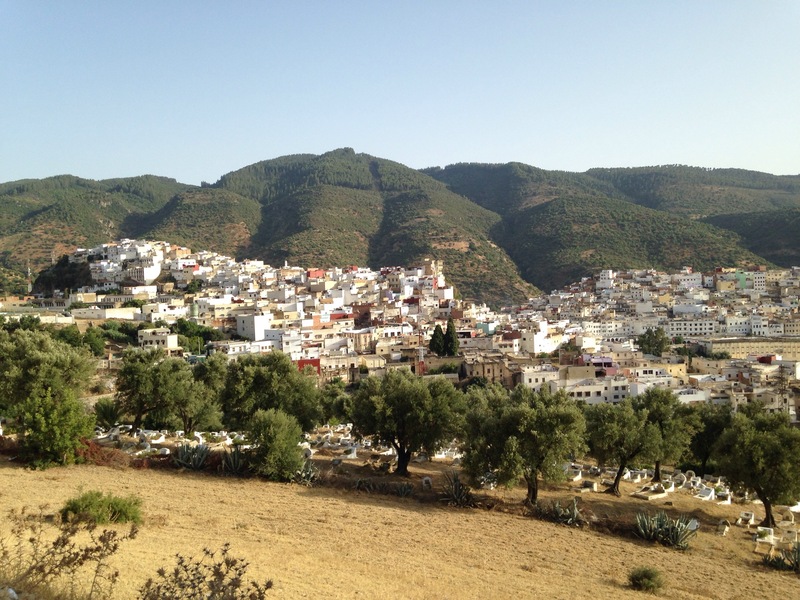 Muslims unable to afford a pilgrimage to Mecca can visit Moulay Idriss five times in their lives and it counts as one of the five pillars their faith. We arrived late in the day and made immediate friends with two couples, Wayne and Jenny from Australia and Bas and Margaaret from Holland, both staying at the guesthouse. Within an hour of arriving I was off with Jenny and Margaaret to the local Hamman, Moroccan bath house, to be scrubbed and washed as is the custom before prayer. Jon remained with the guys sipping Moroccan tea and emailing. 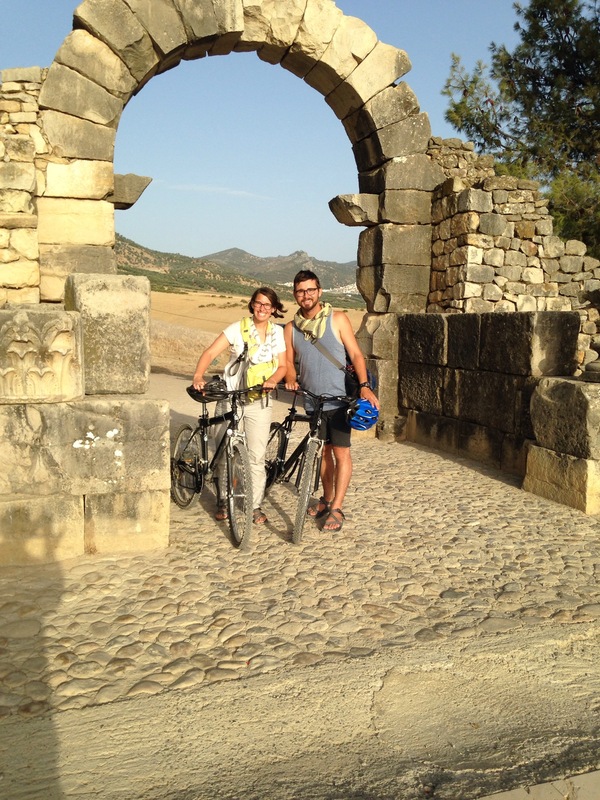 After a fabulous time with Moroccan woman at the Hamman, Jon and I rented mountain bikes and headed to the Roman ruins for sunset. 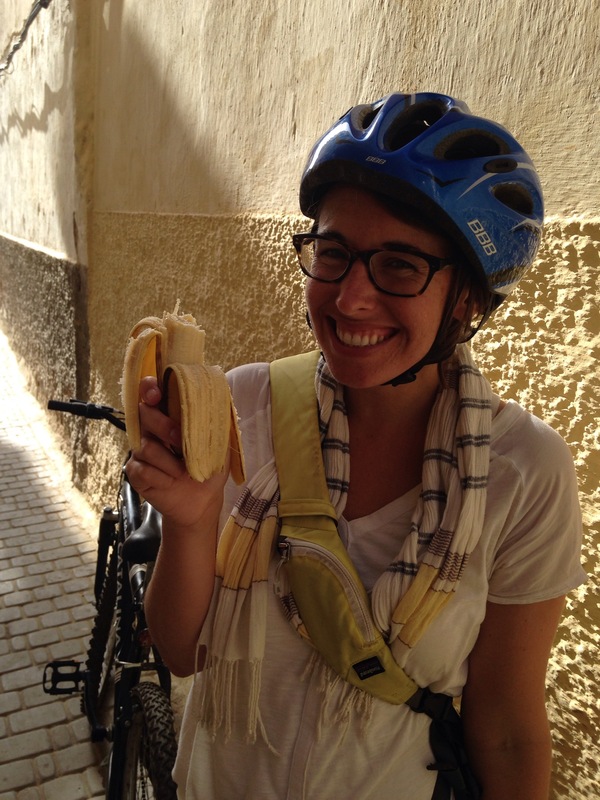 We noticed one of the tires on the bikes was flat, so I waited outside the guesthouse with my helmet on outside eating a banana while Jon looked for a pump. A man stared up the street towards me, embarrassed that I was standing with a helmet on and now a banana peel in my hand I awkwardly scoot closer to the wall of the small of the alley. As he passes he says, “Bonjour!” and gestures for my banana peel. He took, smiled, and I suppose was going to discard it for me. So nice! Why am I so awkward?! 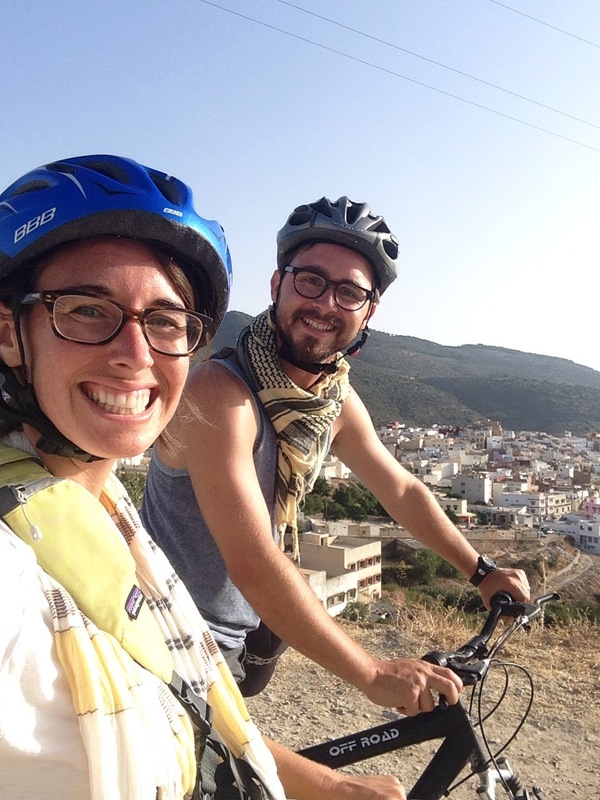 We rode up the hill overlooking the ruins and city and then enjoyed a quick ride down. 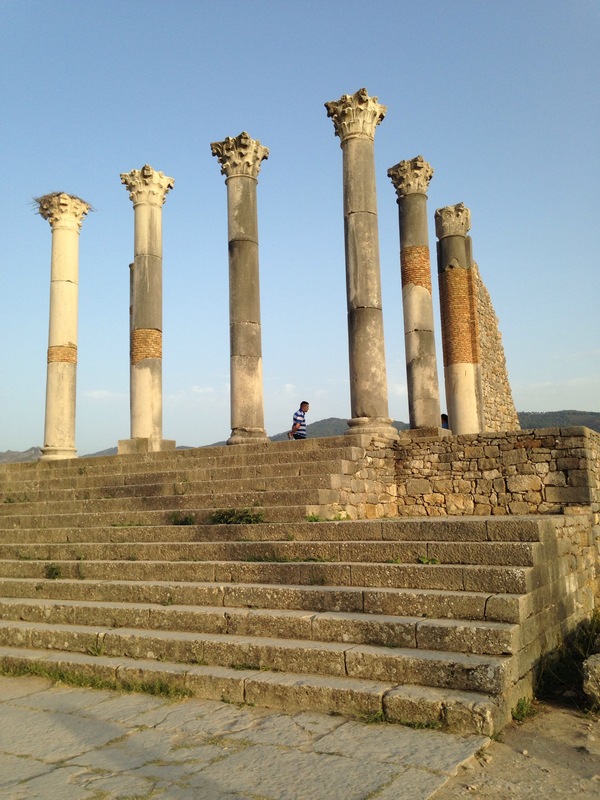 The Volubilis ruins were spectacular. The city was so intact it was like we were transported back in time. 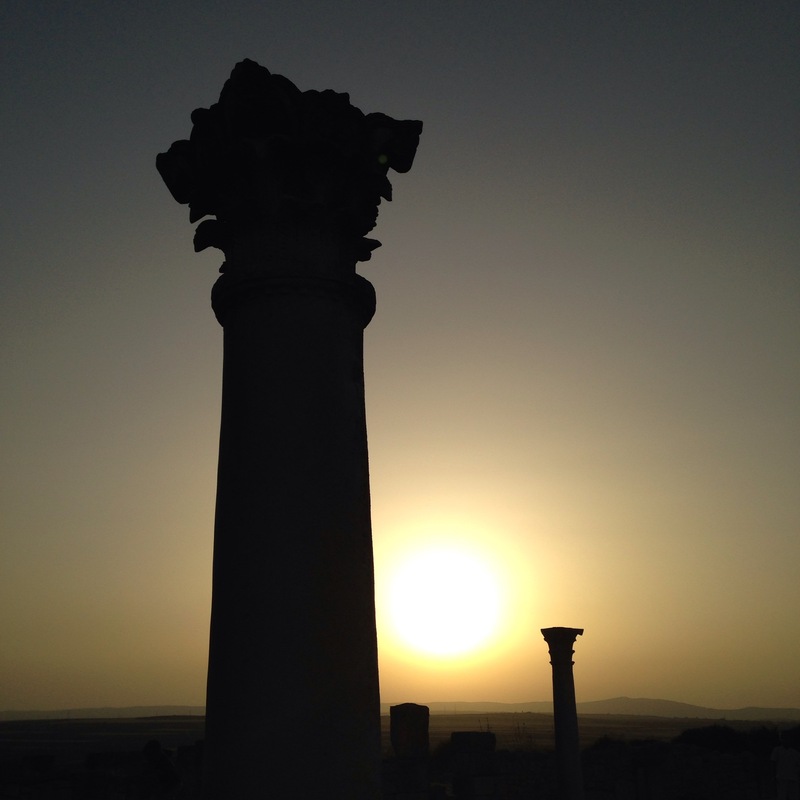 It was magic hour and the ruins glowed. 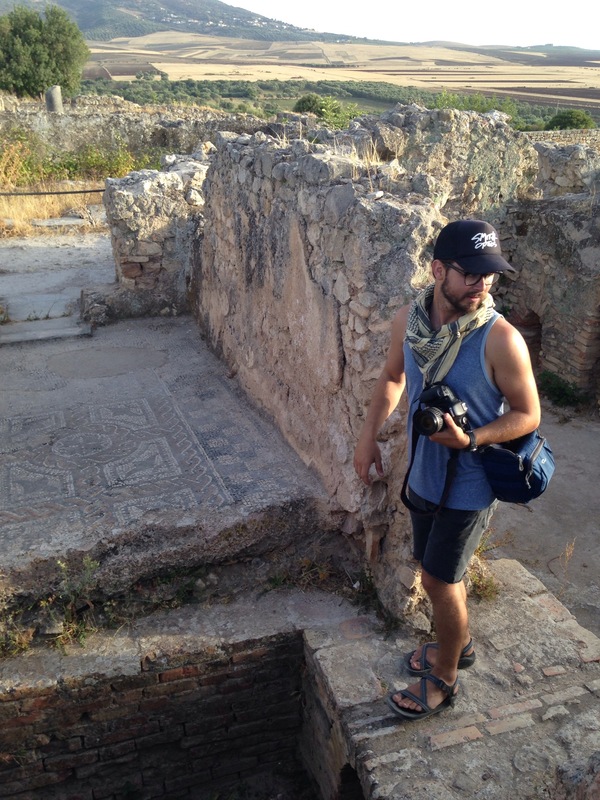 We only had an hour to explore all the sites and see as many of the remaining mosaics as we could. I love how free we felt in such an important archeological site. In the States this would have been highly regulated. 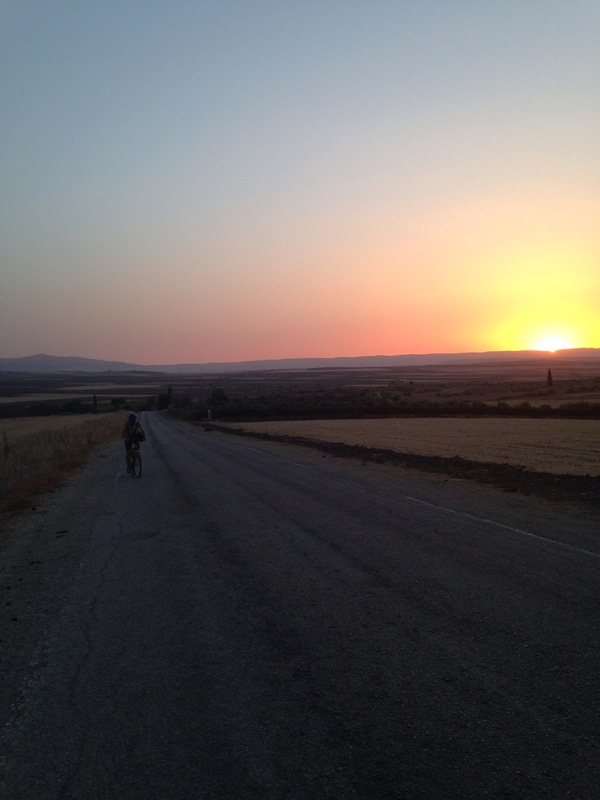 As the sun set behind the ruins we knew we had to start our journey back to Moulay Idriss. What goes down, must come up and that’s what we did for the next arduous 45 minutes. The views of the city at night was breathtaking as was the ride, literally breathtaking. Once we arrived back to the city, drenched in sweat with victorious grins on our faces, we still had to tackle the stairs up to the guesthouse. Half way up a boy ran up to me and said, “Me, mademoiselle!” And I willingly surrendered by bike and 5 Dhs upon arrival. 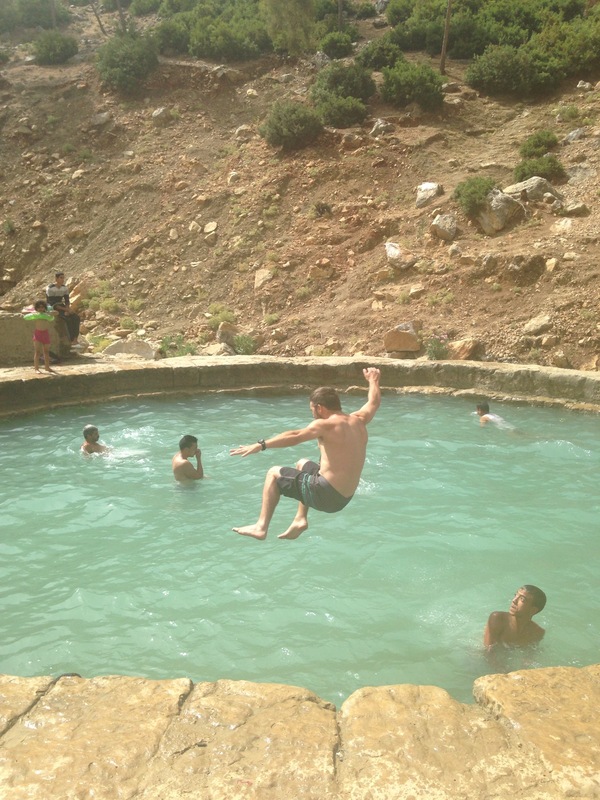 The next day we shared a taxi with the Australian couple to the blue city of Chefchaouen (four hours north) after a nice hike to the Romans baths in Moulay Idriss. 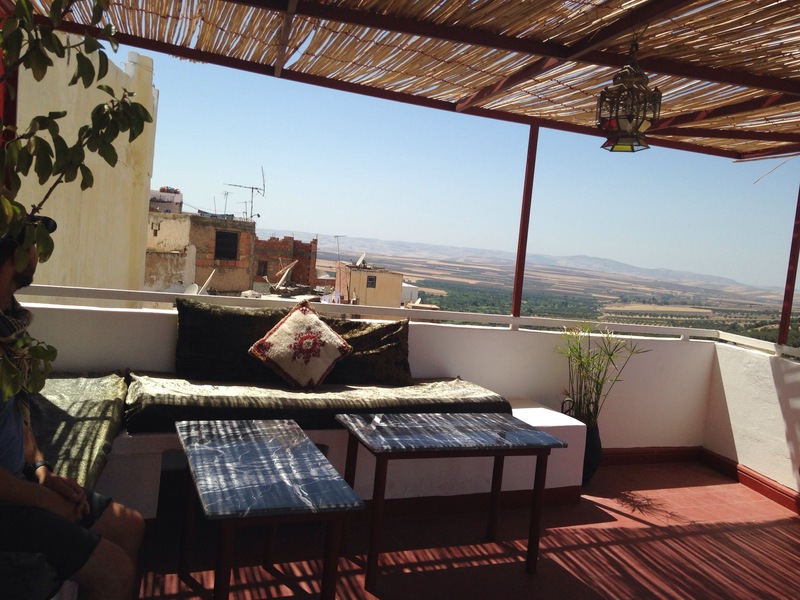 Posted in Morocco, Moulay IdrissBookmark the permalink.